OEMs will aggressively get into the “virtual steering” market, and the result will be “OnStar on steroids,” Mike Anderson of Collision Advice predicted in a video posted this week on YouTube. The presentation, actually delivered in May at the Paint, Body & Equipment Specialists Conference (see all slides), depicts a future in which being part of a OEM’s certified network could be as important as being in a direct repair program. It also indicates that the real incentive to OEMs to do “virtual steering” by recommending a shop with an onboard systems like OnStar is really brand protection. Sixty percent of people who return the car to the auto body shop for some new or unresolved issue related to a collision repair will sell or trade that car in a year, he said. And of those, 63 percent will switch to a different make of vehicle, according to Anderson, who unfortunately doesn’t give the source of his statistics in the video clip. Body shop didn’t fix your 2014 Ford Focus correctly — whether from their mistake or what an insurer told them to do? You trade it in for a 2015 Chevrolet Cruze. So that’s why a “virtual steering” — Anderson said the term was coined by AudaExplore Vice President Rick Tuuri — revolution could be imminent from OEMs, according to Anderson. “They’re going to step up their game and they’re going to get in there,” Andeson said. He said OEMs predicted this at a San Diego conference he attended. “They said that within two or three years, vehicles would notify the OEM when the vehicle was in an accident as well as that it was non-driveable,” he said. 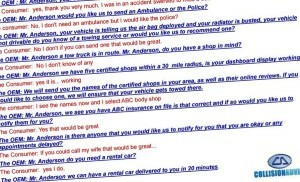 Anderson presented a scenario where your vehicle notices you had an accident, and an operator asks if they can call a tow truck, and then asks if you have a body shop in mind. if you don’t, it suggests an OEM-certified shop in the area. “Think about OnStar on steroids,” Anderson said. Insurers are taking the technological concept seriously — the executive described by Anderson apparently aside. He said that some are already talking with manufacturers about being a certified carrier for the OEM brands. Correction: This article had contained an incorrect date for the Paint, Body & Equipment Specialists Conference, and it has since been corrected to reflect the event occurred in May.